Don’t judge a book by its cover – or an album by its lead single. 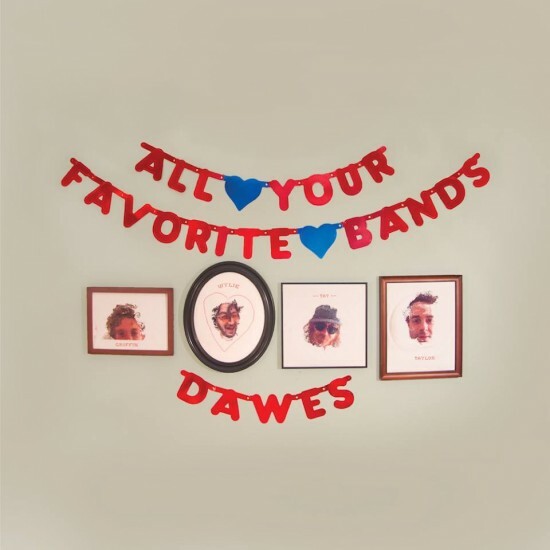 Released two months ahead of Dawes’ fourth record, “Things Happen” sounds like a harbinger of major changes to come. The drums are muted, as though they’ve been draped with towels to muffle their punch. The electric guitar, traditionally the lifeblood of Dawes’ medium-paced folk-rock, sits low in the mix. For an album that was tracked during a series of live takes, with producer David Rawlings aiming to capture a snapshot of a road band in its natural environment, “Things Happen” – the very first track on All Your Favorite Bands – doesn’t quite live up to the real thing. Eight weeks later, the rest of the album has arrived … and it’s well worth the wait. More aligned with the band’s debut than 2013’s Stories Don’t End, All Your Favorite Bands is an inspired record full of space, swagger and warm, analog glow. Rawlings’ production feels raw and roughhewn at points, but it suits the music, making the nine-song disc feel less like a studio project and more like a bootleg of a killer gig in which everyone’s well-rested, supercharged and just the right amount of drunk. Taylor Goldsmith’s voice steals the show, rattling off rapid-fire lyrics about lost loves and long horizons with all the articulation of a stage actor. He’s stunning when he sweeps into the sky-high pre-chorus of “Right On Time” or raises the octave during the final minutes of “I Can’t Think About It Now,” and he matches his melodies with plenty of fretwork firepower, waiting for key moments – such as the outro to “Somewhere Along The Way,” the album’s best track – to turn up and get down. The rest of the band shines brightly, too, particularly during slow-motion ballads like “Waiting For Your Call,” where the guys slow down the chorus by several BPMs for three short, stunning seconds. Why? Because they can. Because it demands our attention. And because that’s something a group would normally do in concert, rather than the studio. With All Your Favorite Bands, we get the best of both worlds.